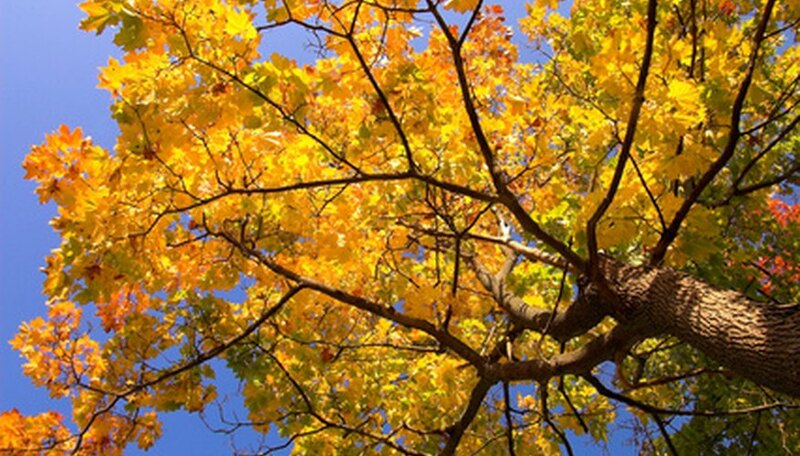 In 1956, the state of New York named the sugar maple tree the state tree. Of the seven species of maple trees, the sugar maple is the most abundant in the state. Maple syrup is made from the sugary sap of sugar maple trees. The tree is found throughout New England and in states surrounding the Great Lakes, as well as in many areas in Canada (hence the maple leaf on the Canadian flag). The average sugar maple tree grows from 70 to 90 feet tall, with a trunk approximately two to three feet in diameter. Sunlight exposure affects the growth of the tree's crown. Sugar maples grown in direct sunlight have canopy spreads 60 to 80 feet in diameter. Those grown in forests, where there is shade and heavily filtered sunlight, have crowns that are narrow and tapered upward. According to the Cornell Sugar Maple Research & Extension Program, the largest specimen of the sugar maple tree was reported near Bethany, West Virginia. That tree was 110 feet tall, with a trunk diameter of 5.6 feet and a crown spread 75 feet across. The leaves of the sugar maple tree are symmetrical, with the line of symmetry running down the center vein. Each leaf measures three to six inches in length, with five pointed lobes. The leaves are dark green on top, with lighter green undersides. The veins are on the upper, dark green side. The sugar maple leaf is featured on the Canadian flag. The sugar maple tree produces blossoms in the spring. The blossoms are light greenish-yellow. The flowers grow in clusters that measure one to two and a half inches long. The flowers of the sugar maple tree contain both male and female parts on the same tree. All maple trees produce fruits called "samaras." The sugar maple tree produces samaras in sets that are connected together. These fruits are referred to as "double samaras." The double samaras are oval-shaped fruits with attached "wings." The double samaras are sometimes called "double winged samaras" because of the wing-like appendages. The bark on young sugar maple trees is dark gray in color. The bark turns dark brown as the tree gets older and develops vertical grooves along the length of the trunk. These long plates of bark curl outward, and peel off--from the top or the bottom edge--as the tree matures. How Much Maple Syrup Does a Tree Produce?